I am re-posting here the post I wrote for Justice for LB, explaining why I think #LBBill is so important as part of the campaign for disability rights. I would be very grateful if everyone who agrees could take five minutes to contact their MP and ask them to support the Bill. It will take multiple contacts from campaign supporters to persuade MPs that this is an important issue. This is the first in what I hope will be an occasional series of guest posts on some of the themes and issued covered on this blog. It is written by Joanne Allman with input from Bee Jones from the campaign group SOS Transport Sefton. I saw some of the work of the group on Twitter and thought they captured perfectly what it takes to fight back successfully against the cuts to disability and children’s services. There is much to be impressed by reading Joanne’s account of the campaign, but from my perspective I particularly like how the potential for a legal challenge was integrated into the overall campaigning work. The campaign also shows the importance of engaging at the highest possible level, in this case with the Council Leader. As we wait for more cuts to to be announced in the new government’s ’emergency’ budget this summer, I hope Joanne’s words and the work of the campaigners in Sefton will help inspire other groups, nationally and locally, who are challenging the consequences of austerity. All comments welcome – as are other suggestions for guest posts. Campaign group SOS Transport Sefton was born of two parents in a meeting room in a special school in Southport, Merseyside on 23 February 2015. The meeting had been called by Sefton Council as a part of their public consultation on post-16 Special Educational Needs and/or Disability (SEND) school/college transport. It was attended by just two parents, Janet and myself, who both had 15-year-old children with severe autism at the school. The meeting was not well-publicised, and many parents simply didn’t know about it. The main focus of both the meeting and the Council’s consultation questionnaire, issued a couple of weeks previously, was their stated intention of promoting ‘independence’ for children with SEND. According to the Council, young people over 16 would be taught to travel independently to school or college through a ‘Travel Training’ scheme. On the surface, it may all sound perfectly reasonable, even laudable….until you wake up from the seductive daydream of teenagers happily waiting at bus stops, and remember that our special school caters for severely disabled children. Paraplegic children in wheelchairs. Children with complex medical conditions. Children who are tube-fed. Children, like my own son, with profound learning difficulties who need constant supervision. What are the alternatives for these children, we asked. The reply was that there was none. Parents would have to take their children to and from school each day. Again, this may not seem such a big deal…until you appreciate that special schools may well be many miles from the family home. 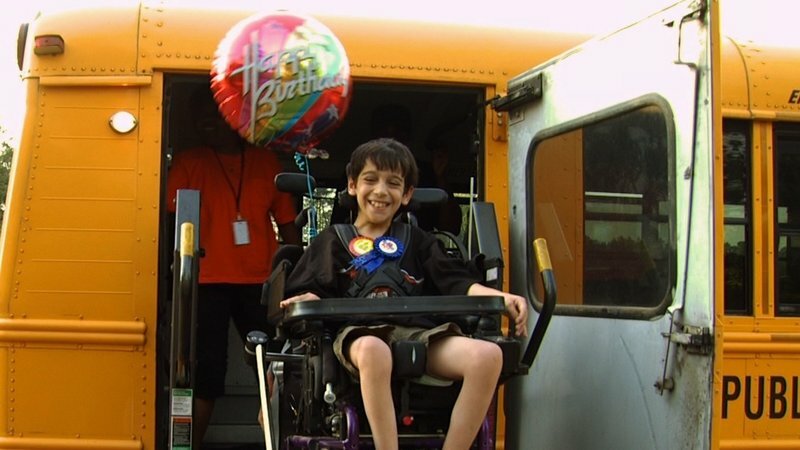 Parents without a car might have long distances to travel each day by public transport, in some cases escorting a young person in a wheelchair. Some parents told us they would have to give up their jobs in order to take their children to school, which would cause them hardship. And these are families already under pressure, be it financial or stress or health related. These issues gave birth to SOS Transport Sefton…although neither Janet nor I realised it at the time. We had a quick chat after the meeting and decided to write a letter to all the other parents to inform them of the impending transport cuts. That was 23 February 2015….BUT on 23 April, exactly two months later, the Council stated publicly and unequivocally that they would NOT remove post-16 transport to special schools or colleges in Sefton. So how was this achieved? These are the steps we took to persuade the Council to change its mind. Bear in mind that we spent virtually no money on this campaign. It’s always a good idea to team up with like-minded campaigners who share your goal. Janet and I were lucky enough to be joined by two very determined individuals, Bee and Sarah, also parents of teenagers with autism. We all brought different skills, strengths and experience to the group, and gave each other much-needed moral support. Bee had already approached a Public Law solicitor before joining our group. As it happened, the Council withdrew their proposal to remove transport before the case was brought, but the threat of legal action may have had a bearing on their decision. We set up a Facebook page and a Twitter feed, to raise awareness of the Council’s proposals, and to give updates on our campaign. This proved to be enormously effective. We soon attracted over 200 followers on Twitter and garnered a similar number of ‘likes’ on Facebook. Social media were a crucial factor in the success of some of our later initiatives. We started our petition on 4 March, and gathered signatures both on paper and on-line. By the close of the public consultation period on the 30 March, in less than four weeks, 2,779 people had signed on paper and 2,559 on-line, totalling 5,338. This meant that our petition was eligible to be presented at a full Council meeting, because the number of signatures exceeded the threshold of 2,750. There was widespread coverage of our campaign in both print and on-line versions of local newspapers, for example here and here. On 30 March, we held a peaceful demonstration march in Bootle, where Sefton Council is based, to hand in our petition. Around 35 people took part, mostly parents, with several children in wheelchairs who had been given leave of absence by one of the special schools in support of our cause. At Bootle Town Hall, we discussed the issue with Peter Dowd, Council Leader and Labour Party Parliamentary candidate for Bootle. This galvanised the four of us into action, and took our campaign into the political arena. Over the Easter weekend, we challenged Dowd on Twitter about the dissonance between his election pledges and his stance on disability transport as Council Leader. A ‘Twitter storm’ ensued, after which Dowd blocked all our Twitter accounts! We contacted the press, and the story appeared in the local newspapers. Details of the Twitter row can be found here and here. We resolved to continue to highlight the disparity between Dowd’s pledges and his actions as Council Leader by writing an open letter from the standpoint of a parent of a disabled teenager. We published the letter on a new campaign blog, runawaybus. We promoted our blog on social media, and the day it was launched, it attracted 280 visitors and 395 views! The questionnaire issued by the Council as part of their public consultation was not fit for purpose. Couched in language more reminiscent of a teenage magazine quiz than a serious survey, it appeared to have been designed to dupe the respondent into giving the answers that the Council wanted. We hit on the idea of giving the Council a taste of its own medicine by writing a parody consultation questionnaire and emailing it to 70 Sefton councillors and council officers! The parody version was written in the same style as the offending original, and was humorous, but hard-hitting. We collected over 100 email addresses for national newspapers and other news outlets, and on 20 April we issued a press release. Later, we were contacted by BBC Radio Merseyside and the next day…..
Bee was interviewed for several minutes on BBC Radio Merseyside, and put our case very persuasively. A clip of a pre-recorded interview with Sarah was also broadcast. Our story was featured as first or second item in every news bulletin that day, and the radio station also invited a spokesperson from the National Autistic Society to discuss it. On the day of the radio broadcast we had a private meeting with Peter Dowd and two Council officers. They gave us a categorical assurance that there would be no cuts to disabled transport to any of Sefton’s special schools or colleges. On Thursday 23 April we presented our petition at a full Council meeting at Southport Town Hall. In response, Leader of the Council Peter Dowd gave an assurance, on the record, that there would be no cuts to transport to any special schools or colleges in Sefton. He also acknowledged the flaws in the consultation process which we had highlighted, and invited us to assist in efforts to improve the way future consultations are carried out. So, on St George’s Day, two months to the day from the birth of our campaign, the dragon of cuts to transport to specialist provision was finally slain, and the worry caused by the threat of removal of this vital service laid to rest. A few days later, we issued the following public statement. Know that if your sense of justice has been offended, there will be others who share your outrage and anger. In the twenty-first century, we have an enormous advantage over campaigners from previous generations because the internet gives us the tools to link up very quickly with like-minded people. It’s quite straightforward to set up a Facebook page, a Twitter feed, even an on-line petition; yet these simple steps can be very empowering because they bring people together and provide a focal point for opposition. Don’t try to run the campaign on your own. Find a few other people to share the decision-making, organisation and work. You’ll probably come up against vested interests, underhand tactics and intimidation, and you’ll need moral as well as practical support. Don’t under-estimate your individual strengths; you may have experience of writing or public speaking, perhaps a social media presence or other useful attributes. When these resources are pooled, the resulting synergy can make the difference between success and failure of your campaign. Publicity is the oxygen your campaign needs to flourish and succeed. Make contact with journalists via social media, where it might be possible to develop an informal, friendly relationship. Maximum coverage for your story in the local press will both attract supporters and put pressure on the authorities you’re campaigning against. Consider issuing a press release to reach a wider audience. Take your chances and be bold. When opportunities present themselves, seize them. In our case, the upcoming General Election made the bad publicity we created for a local candidate decidedly inconvenient. You can’t guarantee lucky breaks, but if a gift horse does happen to wander across your path, jump on and ride! Have fun! The issues you are facing may well be very serious, but confronting them and taking back some control over the situation will probably be therapeutic and make you feel a whole lot better. You may discover skills you never knew you had, or learn new ones, grow in confidence and find new friends. A sense of common purpose can break down barriers and forge bonds between people who may not otherwise have had the opportunity to get to know each other. Even if your campaign does not achieve what you hope it will, you may find you reap other unforeseen benefits and rewards. Set your sights on your destination, but don’t forget to enjoy the journey. Extend the timeframe for transfer from statements and Learning Difficulty Assessments (LDAs) to Education, Health and Care Plans (EHC Plans). It was never going to be possible to transfer all children and young people with statements / LDAs over to EHC Plans by April 2018 unless the transfer process was going to be a sham. And in many areas that seems to be exactly what has happened – no proper transfer review, simply a rebadging of statements as Plans often led by the school with minimal Local Authority input. The Minister should now consult on a sensible extension of the timetable for transfer, predicated on every Local Authority ensuring that a proper transfer review takes place in every case, involving social care and health as required. Extend the timeframe for carrying out EHC assessments. I anticipate this one may be controversial – but it seems to me very difficult for a local authority to ensure that in every case a proper EHC assessment is carried out with input from social care and health and for the process to be completed within 20 weeks. In my view the Minister should consult widely on whether a slightly longer timeframe should be allowed, again with an absolute expectation that the assessment process will be carried out properly in every case. It seems to me that a proper assessment leading to a lawful Plan is more important than a quick assessment and ropey Plan – but I understand that families may think speed and quality are equally important. Sort out the confusion in relation to social care assessments. For disabled children who do not qualify for an EHC assessment, the key assessment duty remains section 17 of the Children Act 1989. However the courts have had to read the duty to assess into the Children Act, and there is nothing in section 17 which specifies the form or type of assessment required. Answers to questions like who has to carry out the assessment, what issues it must cover and the timescale are left to guidance, currently Working Together to Safeguard Children. However the High Court in R (L and P) v Warwickshire has held that not all disabled children are entitled to a social work assessment under Working Together. Yet Working Together gives no steer as to which children are entitled to a ‘full’ assessment, and which children can be assessed via ‘Early Help’. It would greatly assist if the Minister were to consult on guidance specific to disabled children which would clarify this critical point. Make the Local Offer real for social care. The Local Offer under section 30 of the Children and Families Act 2014 has the potential to create a baseline entitlement for all disabled children and families, but only if there are actually services available for families to access under it. One important step which could be taken by the Minister to help achieve this would be to issue guidance requiring every Local Authority to have a minimum short break entitlement with no or very minimal assessment and eligibility criteria. This would obviously be additional to the support available to children who hit eligibility criteria for support under the CSDPA 1970. Guidance currently describes this kind of offer of unassessed short breaks as good practice, but if it were to be mandatory then the Local Offer in social care would start to have some real value. Reissue the National Framework for Children and Young People’s Continuing Care. It is vital that disabled children with complex health needs get a package of care and support that is properly co-ordinated and centred on their needs in their family context. The National Framework is supposed to achieve this, but it is badly out of date and does not reflect the reforms introduced by the Health and Social Care Act 2012. For example, the Framework still refers to ‘Primary Care Trusts’ which have been abolished and replaced by Clinical Commissioning Groups. It also does not reflect the vital role of NHS England in commissioning packages of care for children with the most complex needs. The National Framework therefore needs to be reissued urgently, and when this is done its status must be clarified; CCGs and Local Authorities need to know whether they are expected to follow it or the question will be left to the courts to decide. I am not suggesting that any of these measures, either individually or taken together, will lead to the kind of radical transformation in education, care and support that disabled children and their families need and deserve. However they seem to me to be the kind of practical steps that the Minister can take to help the system introduced last year work more effectively. Comments on these ideas and other ideas for priority action most welcome below. On the eve of the general election, the Justice for LB campaign published draft two of #LBBill. The proposed new law in LB’s memory is intended to promote disabled people’s right to live in their community with choices equal to others. Thanks to the hundreds if not thousands of people who gave feedback on draft one and to all everyone who has worked on draft two. The purpose of this post is to flag the materials published with draft two of the Bill and invite comment and feedback. Changes can still be made and a further draft can be produced if needed. We would also welcome your support for the Bill – you can sign up as a supporter here if you have not yet done so. For more background, please see the Bill website and my earlier posts on this blog. We look forward to your thoughts and comments and hopefully your support. Once we have new MPs we will be lobbying them all to support the Bill, including through adopting it if they are chosen in the Private Members Bill ballot in July.